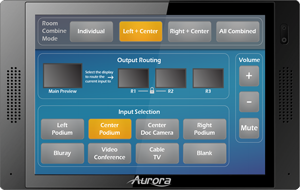 New products from Aurora at InfoComm Day 1 - Booth 3059 - Aurora Multimedia Corp.
At InfoComm 2015, Aurora will be showcasing the revolutionary IPX-TC1 Audio and Video over IP Transceiver. Leveraging Aurora’s IPBaseT™ Technology, the award-winning device is the market’s first 4k2k transceiver with zero compression and zero latency. Combining the ability to use the unit as a transmitter or receiver, the solution greatly simplifies overall system design, ordering, stocking, and deployment. Equipped with an option slot to add IP capabilities such as USB 2.0 over IP or Dante audio, the complete, distributed system also enables audio, video, data, and control to be securely delivered to one or many units using standard 10G Ethernet Fiber switches. The IPX-TC1 can support up to 128×128 channels with HDCP and provides users with an OSD menu and web-server to deliver incredible ease of use. The Aurora V-Tune Pro 4K tuner is the industry’s first 4K2K RF Tuner / IPTV all-in-one solution. Designed for any integrated system requiring IPTV, ATSC, QAM, NTSC & PAL, the tuner is capable of decoding MPEG2, MPEG4, VC-1, H.264, and H.265 with resolutions up to 4096×2160 at 60Hz via both RF and LAN. In addition, the innovative device is equipped with an onboard 4K scaler for viewing 1080P HD content on 4K displays. To facilitate the installation process, V-Tune Pro 4K allows cloning of channel configuration over USB or LAN and accepts IR, RS-232, and IP-based control in addition to the ability to program any channel for OTA/Broadcast or streaming content from local area networks. Users simply switch between content by changing channels – providing cost-effective solution for any rich media application. Decodes up to 4K digital content (web cam/digital signage/educational material etc.) streaming on network direct to individual channels same as QAM modulated content. IR remote and built-in web interface for easy control from anywhere! 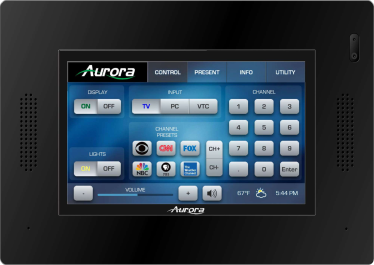 Aurora’s innovative QXT quad-core HD touch panels are a platform-agnostic solution embedded with an integrated control processor. Featuring a high resolution screen and 2D/3D graphic accelerator, these units ensure both stunning graphics and a responsive GUI experience for a wide variety of environments. Equipped with a quad-core processor, PoE-enabled 1 Gbps LAN port, multiple on-board RS232/IR/Relays, as well as DIO, the QXT touch controllers are specifically designed to bring more efficient control to any conference room, classroom or hospitality AV application. A built-in web server and HTML based control interfaces support iPad, Android, and other tablets, as well as virtually any device with a web browser.